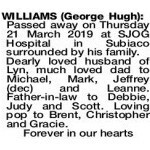 The Funeral Service for the Late George Hugh Williams (Hugh) of Bakers Hill (Northam on Avon Lodge 12) will be held at the Bakers Hill Recreation Centre, St George Street BAKERS HILL at 11am FRIDAY (29.03.2019) followed by a Private Cremation. 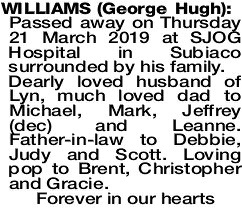 Passed away on Thursday 21 March 2019 at SJOG Hospital in Subiaco surrounded by his family. Dearly loved husband of Lyn, much loved dad to Michael, Mark, Jeffrey (dec) and Leanne. Father-in-law to Debbie, Judy and Scott. Loving pop to Brent, Christopher and Gracie. Loved brother, uncle and friend of Thelma (dec), Lesley, Terry and Loxton boys and families. Our love to Lyn, Michael, Mark, Leanne and families. 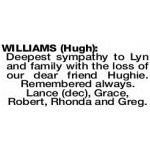 Deepest sympathy to Lyn and family with the loss of our dear friend Hughie. Remembered always. Lance (dec), Grace, Robert, Rhonda and Greg. 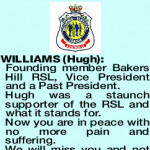 WILLIAMS HUGH Founding member Bakers Hill RSL, Vice President and a Past President. 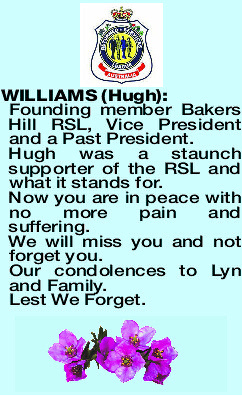 Hugh was a staunch supporter of the RSL and what it stands for. Now you are in peace with no more pain and suffering. We will miss you and not forget you. Our condolences to Lyn and Family.